I’m on the mailing list for the South East London Film Club Listings which told me that the film Belle was showing at the Woolwich Grand Theatre Film Club tonight, tomorrow (24th) and Saturday (25th) at 5pm (not Saturday), 7pm and 9pm, for a fiver. It’s a lovely film which I was surprised to have missed on its main release and particularly nice to see lots of Greenwich and other recognisable bits of London on the screen. Beautiful music too, which was by Rachel Portman (she also did the scores for Emma and Chocolat among others) and a very pleasant screening room – I got a comfy sofa as I went for the 7pm screening so it was super quiet. The people running it made me a cup of tea as well and as there was no popcorn on-site I nipped across the road to the very futuristic new Tesco that seems to have sprung up since I was last in Woolwich (other than for the Tall Ships). I also spotted the open air screen (free) in General Gordon Square which seems to show cultural things. I think it was showing a music performance but couldn’t hear any music. 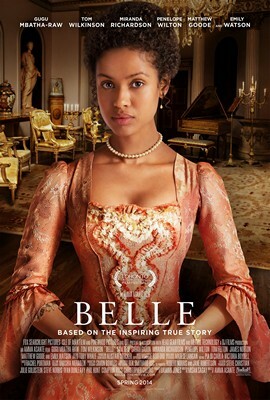 Belle tells the true story of Dido Elizabeth Belle, the illegitimate daughter of a white Navy captain and a black slave woman who dies. The father brings his daughter to the family home (Kenwood House, actually for real, not just used as the family home in the film, it’s where they lived) of his aunt and uncle and asks them to look after her for him. She has a good status (rank and money, particularly after her father’s death where she’s left with money) but as someone of mixed race and illegitimate she is excluded from formal family dinners and debutante events. Her family treat her kindly, but still as ‘other’. Her uncle (William Murray, 1st Earl of Mansfield) is the Lord Chief Justice at the time and is working on a dodgy insurance claim relating to a ship which jettisoned its slaves (to drown) and claimed that this was to maintain the survival of the ship. He has to make a judgment on the case – whether to make the insurers pay for the loss of the ‘cargo’ or to apportion blame to the ship’s crew who made the decision. There’s a romantic sub-plot and a happy ending for Dido and the events depicted in the film led to the eventual abolition of slavery in the UK. Woolwich is about half an hour away from Blackheath (depends on the bus route but 53, 54, 380 and 422 go from the Village or Shooter’s Hill / Standard areas) and all those buses return to Blackheath from Bus Stop S which is opposite the cinema, by the library. Here are some pics I took of the Woolwich Grand Theatre’s main hall and the area leading up to the red room (where the screening took place).